All minimalism, all minimalists are not equal. La Monte Young was the pioneer. His music can be mesmerically exciting, filled with Eastern bliss, and can otherwise be fascinating in his cosmic elevations, but sometimes the slowness of pace, the relative changelessness can be excruciating. Terry Riley has been, always, a major figure. His In C was the first minimalist masterpiece and continues to beguile because the ensemble takes such an important role in its unfolding. He combines kinetics with beauty in his very own way. Steve Reich I find consistently worth hearing, whether it be the early processual works, the neo-African rhythmic pieces, or his more compositionally varied later works. There are the composers that I've been covering on Cold Blue records, who are generally very lyrical when in a minimalist zone. And then of course the now famous Philip Glass. His early period, characterized by Music in Changing Parts had great motility and continually shifting phrase lengths. It was exciting. Einstein on the Beach had this too along with an ensemble drive that kept me interested. And then...well not everything he did after that was to me a masterpiece. Now he seems to be beyond minimalist repetition, and I found his timpani concerto piece (reviewed here several weeks ago) to be well worth experiencing. 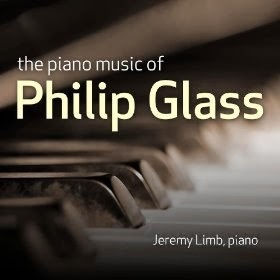 Today we look at a pretty comprehensive volume, a two-CD set, The Piano Music of Philip Glass (Quartz 2102), as played by Jeremy Limb. There are three main groupings, eight pieces from The Hours, Trilogy Sonata (based on excerpts from Einstein on the Beach), and Metamorphosis 1-5. There is a shorter unrelated end piece at the beginning and end of the set. You can expect me to be frank, always, and I'll say that the Hours pieces do not hold up well for me. Glass no doubt was working his way toward something, from kineticism to a more lyrical, more pianistic approach. But the choice of motifs, chordal and sometimes melodic, seem not interesting enough to sustain repeated onslaughts. They are sometimes quite simple progressions that seem as if Chopin wrote some subordinate accompaniment for two left hands, and had not yet put together right-handed melodies. Others almost sound like they could be doo wop piano backgrounds. Still others sound a little too new age in the unproductive, banal sense. Glass was finding his way forward, but had not really gotten there, in my opinion. So the first disk to me is not essential listening unless you want a full vision of Glass and where he has gone. On the other hand, the works (Trilogy, Metamorphosis) on disk two have similar objectives but seem much more satisfying. The choice of material is not banal and does come to grips with a sort of neo-romantic aura. There is enough substance to the motifs to sustain the sustaining, so to say. Pianist Jeremy Lamb does an excellent job with the music, with just a hint of rubato and a sensitive touch to bring out the lyrical content as it happens to be there. It's a two-CD set, so you get both disks. And the second disk makes it all worthwhile. Those are my mixed feelings. Neither minimalism or any other -ism has dominated the new modern music these days. So we thankfully do not have to experience an "all-or-nothing" hegemony out there. This music fits in as a part of the "all" and does so well on the second disk, less well on the first.